Without a doubt, peer-to-peer fundraising is among the most effective and engaging fundraising methods out there. By accessing the power of your supporter community, your nonprofit can quickly reach its fundraising goals while making connections with new individuals to rally around your cause. Not only that, but peer-to-peer fundraising is one of the best ways to get up-close-and-personal with your community and start learning what makes them tick. 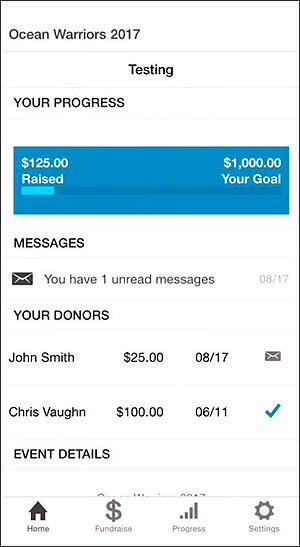 When your team adopts the right suite of peer-to-peer fundraising software, there’s nothing getting in the way of your cause and its goals. Think your nonprofit is ready to make the big leap into strengthening your peer-to-peer fundraising strategy? Then it’s time to learn how to plan stellar peer-to-peer fundraising campaigns with our smart best practices. Design an inspiring P2P donation page. Keep your mobile supporters connected. Promote your P2P campaign on social media. Set up peer-to-peer fundraising teams. Make use of P2P fundraising gamification. With the right know-how, your nonprofit’s peer-to-peer fundraising strategy will never be the same! Let’s dive into these awesome P2P fundraising best practices. 1. Design an inspiring P2P donation page. Your peer-to-peer fundraising campaign’s fundraising pages aren’t just where supporters donate. They’re also the primary point of access for your community members to find out about ongoing campaigns and get inspired to give back. Choose a peer-to-peer fundraising platform that prioritizes customizability when designing your core P2P campaign pages. These pages should uniquely communicate the identity of your organization while giving volunteer fundraisers the tools to add a personal touch. Lead with an inspirational call-to-action that unites your supporters. Use active, compelling language to capture their attention. Make your pages accessible by link, as well as embed them into your nonprofit’s website to provide multiple ways to access your campaigns on the web. Above all? Think of your peer-to-peer fundraising campaign pages as little fundraising communities. Don’t forget to use an impactful, high-quality image as the face of the P2P fundraising page. This image will add a decorative touch to the page as well as incentivize viewers to become donors by creating an emotional connection. Give your volunteer fundraisers all the tools they need to foster strong relationships on their pages, but also empower your own team with the right features to steward these communities from behind the scenes. Bonus! Excited to learn more P2P fundraising page best practices? Become an expert by checking out our donation page design tips guide. 2. Host a peer-to-peer fundraising event. Since peer-to-peer fundraising came on the scene, events have been a central component of this fundraising strategy. By hosting an event to anchor your campaign, your nonprofit can both engage and motivate your supporters like never before. However, planning and executing effective fundraising events is one of the main challenges nonprofits face. With the right P2P fundraising event best practices, though, this process has never been more intuitive. Choose an event with a broad community interest, like a 5K run or a charity concert. Survey your community before choosing your event style to see what events would excite them. After the event, keep in touch with attendees and donors with segmented email lists. For more insight into hosting stellar peer-to-peer fundraising events, do some research on event fundraising software options. Consider using your event as either a kick-off or a conclusion party for your campaign. A kick-off event is a great way to get your fundraisers excited about the upcoming drive as well as engage the community in the process. A concluding party is another great way by encouraging your fundraisers to invite potential donors in a last-minute push to complete their goals. Consider charging admission as a way to increase donations, as well. If you’re looking for a way to take both your fundraising and your event planning to the next level, consider bringing on a fundraising consultant to revolutionize your fundraising strategy. They’ll be able to help you make the most of your P2P campaign, as well. Check out Averill Fundraising Solution’s fundraising consultant hiring guide to get started. With Salsa’s useful tools, you can lay the groundwork for successful P2P events as an integrated part of your overall fundraising strategy, and not just as a logistic afterthought. 3. Keep your mobile supporters connected. Peer-to-peer fundraising campaigns thrive on social media sites, and it’s no surprise why. Since this fundraising method depends on being shared across personal networks, there’s no better place to do so than on social sites like Facebook. These days, mobile devices (rather than desktop computers) are the device-of-choice for social media users. This means that if your nonprofit wants to boost the way you take on peer-to-peer fundraising, prioritizing the mobile giving experience is a must. 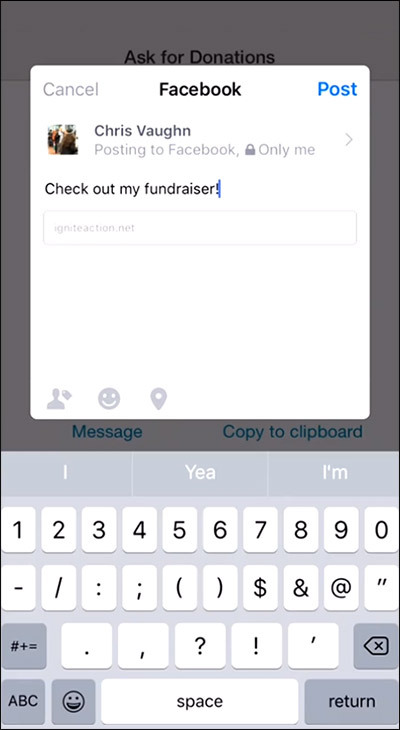 Make your fundraising pages mobile-responsive to smartphone and tablet devices. Post and email educational content about mobile peer-to-peer fundraising to supporters. Offer volunteer fundraisers a mobile app for managing their fundraising efforts. No matter the goals of your nonprofit, understanding the role mobile engagement has to play in peer-to-peer fundraising campaigns is a must! Check out how Salsa’s peer-to-peer fundraising mobile app helps your volunteer fundraisers manage their fundraising efforts from a reliable, streamlined interface. 4. Promote your P2P campaign on social media. On that note, another way to maximize the impact of your peer-to-peer fundraising campaigns is to use smart social media tools to promote and share your cause. When you adopt peer-to-peer fundraising software that takes social media promotion seriously, your team can effectively spread the word about your fundraising needs and get more supporters than ever connected with your organization. Social media publication tools to draft, schedule, and publish consistent campaign content. Social sharing buttons on your peer-to-peer fundraising donation forms. Analytics tools to monitor the activity of your supporters on social sites. Since effective peer-to-peer fundraising strategies are so dependent on your campaigns making a splash on social media, find a platform that puts social media engagement first. Take a look at your social media accounts to see which ones are the most influential, and then target your marketing strategy towards those platforms. Take a look at how this volunteer fundraiser leverages Salsa’s intuitive social media sharing tools to help promote his peer-to-peer fundraising campaign to his Facebook friends. 5. Set up peer-to-peer fundraising teams. At its core, peer-to-peer fundraising is driven by the personal networks of your supporters. More than any other fundraising method, peer-to-peer fundraising thrives on the relationships between your supporters and their friends, family, and coworkers. This is why peer-to-peer fundraising teams are your nonprofit’s secret weapon. These teams allow peer-to-peer fundraising volunteers to get together and raise money for your cause as a unit. Tap into existing communities and amplify connections between your supporters. Provide a support system of people to cheer one another on as they raise money. Can be called on time and time again for future campaigns as a mobilized unit. Be sure to choose a P2P fundraising software suite that offers team fundraising capabilities. Give these groups the power to launch their own campaigns, spread their team fundraising pages to newcomers, and customize their peer-to-peer fundraising experience. Excited to learn more about P2P fundraising teams? Discover how Salsa’s unique team fundraising solutions can boost the mileage of your next peer-to-peer fundraiser. 6. Make use of P2P fundraising gamification. Keeping your volunteer fundraisers engaged with your campaigns is one of the chief challenges of successful peer-to-peer fundraising. After all, without having them there to introduce their personal networks to your cause, your campaigns would quickly run out of steam. For your next peer-to-peer fundraising campaign, try adding gamification strategies into the mix. When fundraising is actually fun for those involved, they’re more likely to be successful and remain supporters of your cause long-term. Adding fundraising thermometers to peer-to-peer fundraising pages and donation forms. Fostering good-natured competitions between P2P fundraising teams. Awarding prizes to exceptional volunteer fundraisers or high-impact donors. Depending on the nature of your nonprofit, some gamification strategies might be more appropriate than others. However, the basic idea remains relevant no matter your mission: when you make fundraising a rewarding activity, people are more likely to stay invested in your campaigns. 7. Capture peer-to-peer fundraising data. Finally, the best way to improve your organization’s overall peer-to-peer fundraising strategy is to get your supporter data in line with the right CRM tools. The more you understand about your supporters and what inspires them, the more effective your P2P fundraisers will be. The best way to do this is to choose a peer-to-peer fundraising platform that fully integrates with your nonprofit’s preferred CRM. This way, the information you learn about supporters seamlessly flows into your database as your campaigns carry on. Segment your data by relevant information including supporter identifiers (age, region, giving history), and giving qualifiers (like campaign, donation size, and giving frequency). Process customized data reports that are tailored to the interests and needs of your nonprofit organization. Get at the heart of your strategy by learning what you need to know. Revise and improve your fundraising strategy throughout your peer-to-peer fundraising campaigns. With seamless data insights, you can make strategic changes now rather than after your campaign ends. The more your nonprofit knows about your peer-to-peer fundraising community, the better. But to really make your campaigns more effective, you’ll need insightful fundraising analytics tools. Keeping accurate and up-to-date data on your volunteers and donors is a great way to make sure that you can keep your community and constituents involved, even beyond the end of your P2P fundraiser. Take a look at how this nonprofit organization leveraged Salsa’s customized dashboard analytics to give their team an bird’s-eye view of their peer-to-peer fundraising efforts. Peer-to-peer fundraising is one of the fastest growing fundraising methods out there, and nonprofits of all kinds are getting in on the action. With these key best practices on hand, your organization is sure to make a splash when you launch your next campaign! Salsa's Peer-to-Peer Fundraising Software. Want to discover what peer-to-peer fundraising has to offer? 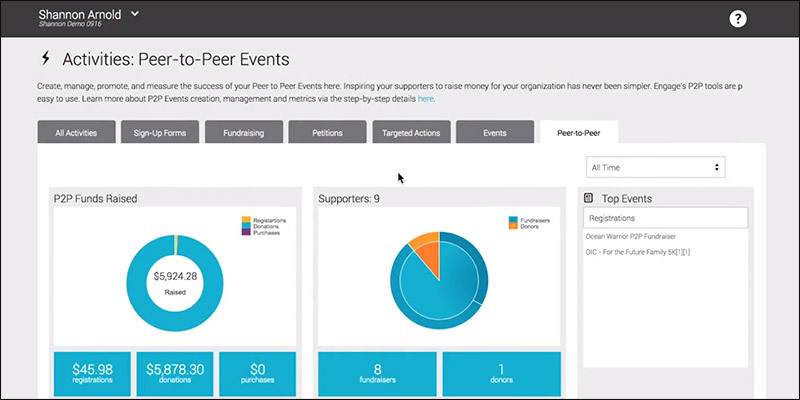 Visit our peer-to-peer fundraising software page to see how Salsa’s solutions can improve your P2P fundraising strategy. Top 10 Online Fundraising Tools Your Nonprofit Needs to Know. Ready to improve your fundraising strategy from the ground up? That starts by investing in the right fundraising tools. Check out our top 10 list of solutions to get you started. Funds2Orgs' 45+ School Fundraising Ideas. Although generally reserved for traditional nonprofit organizations, peer-to-peer fundraising campaigns are a great way to raise money for school causes. Visit Funds2Orgs for more school fundraising ideas!